Editor’s Corner: One moment, please. I was just loading something on my PC and got the common message “One moment, please.” I was wondering, does a moment have a specific duration… I don’t think so. However, if not, then why do we wait for “one moment”? How long is “two moments” or “ten moments”? I think you’ll find the answer to this question fascinating—I sure did! I was just goofing off and I searched for “How long is a moment?” Surprisingly, the simple answer, 90 seconds, returned in less than a moment. I continued to research on Wikipedia to find out more about this precise definition of a term that I thought was sort of vague and open to anyone’s interpretation. A moment (momentum) was a medieval unit of time. The movement of a shadow on a sundial covered 40 moments in a solar hour. An hour in this case means one twelfth of the period between sunrise and sunset. The length of a solar hour depended on the length of the day, which in turn varied with the season, so the length of a moment in modern seconds was not fixed, but on average, a moment corresponds to 90 seconds. 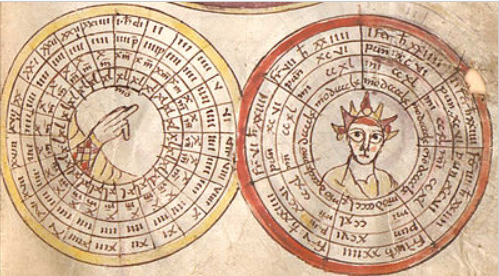 The unit was used by medieval computists before the introduction of the mechanical clock and the base 60 system in the late 13th century. The unit would not have been used in everyday life. For our medieval counterparts, the main marker of the passage of time was the call to prayer at intervals throughout the day. Two circular diagrams showing the division of the day and of the week. The day is divided into 24 hours, and each hour into 4 puncta, 10 minuta, and 40 momenta. Similarly, the week is divided into seven days, and each day into 96 puncta, 240 minuta and 960 momenta. « Editor’s Corner: How Often Do You Get Paid?